First of all, I did not go to Comic Con at San Diego, as I have been working. However, I’ve been waiting to hear if Marvel would be making any announcements about their upcoming Star Wars line, now that there are scant months left before the licence reverts to them. SDCC revealed some details on three books: a Princess Leia title, a Darth Vader title, and an ongoing series. I must admit, now that we have some details on these things, I am beginning to lose some of my ire about the existing EU being trodden-over! So, our story is about Leia not long after the end of Episode IV deciding, “Well, as the princess, there are still responsibilities that fall to me, like making contact with any stray Alderaanians out there who may not know what happened. It is my job as princess to deliver the bad news. It is my job to bring those who survived by being in other places, together. It is my job to help preserve some sort of cultural heritage of my people, so that everything my planet stood for and everything my people stood for doesn’t get forgotten.” So it’s a five-issue story [arc] that takes her across the galaxy in search of others of her kind to try and pull them together. Of course, some of them are going to be suspect, because they suspect this could be some sort of weird trap by the Empire. Some of them are going to be very angry, as they rightly or wrongly blame the house of Organa for what happened. Obviously, Leia will be traveling as low profile as she possibly can. If and when the Empire gets wind of the fact that Leia is doing is this, they’re going to be very interested themselves in what she’s doing, what she thinks she’s doing, and what information there is to be mined from these people. Five issues of running around the galaxy trying to find stray Alderaanians, set in the aftermath of the Battle of Yavin? Sounds like it could be interesting. I really like the idea of a Leia story, as she seems to have been perhaps unjustly neglected by the Legends stories. There were a few issues of Dark Horse’s Empire series that saw Leia in action, but largely the classic trilogy era was filled with tales of derring-do from Han and Luke, with lots of pilots and soldiers and whatnot. Seeing what Leia gets up to will be really good! I really hope we see people like Winter and Tycho Celchu brought back into the Canon fold. Something I had often thought about was whether Winter and Leia knew of each other’s survival, and imagined a fun little tale that saw them meeting up under fire with an emotional reunion. Of course, whether Winter will be kept on as a Canon character will remain to be seen, though I hope that most (if not all) of Zahn’s creations will prove to be too good to leave on the scrapheap. We shall see! The high-level concept is that it picks up very shortly after the destruction of the Death Star. Vader is the sole survivor of the greatest military disaster of all time. A disaster he isn’t entirely to blame for, but at least some of the blame is his. He completely let the Rebels escape with the plans. So this kind of comes back to him. So there’s an implied sense that Vader might not be in the Emperor’s best graces at this point in the story. It’s a story set inside the Empire, but a lot of the driving force is Vader’s own personal choices and the people he keeps around him to achieve his aims. The one problem with doing a book like this is it’s just kind of, Vader plus dudes in uniform plus stormtroopers. It’s very gray, you know? If you move the story into the underworld and [bring in] some of the more colorful characters, you get a much wider tone without undermining Vader. So, an Empire story, but we’ll be investigating Vader as a much more widely-drawn character, looking not only at his position within the Empire, and specifically how he rose from the debacle at Yavin to head of the Death Squadron, but also at the other aspects of his life, including his relationship with the Emperor and his contacts with the galactic fringe. This should be a really interesting story, I feel, and one that I had hoped we’d see back when Dark Horse launched their Empire storyline with Betrayal. I loved that book, but was a bit miffed when we meandered through generic rebellion stories for the most part. While it’s doubtful we’ll see Grand Moff Trachta, I still look forward to seeing a Vader story with some intrigue and stuff! So that should be interesting, too. We wanted this to feel like the movies. We wanted to feel like we were hired to do the direct sequel to the original film. So in terms of look, feel, and tone, that’s what we’re shooting for. It’s very much a team book and we’ve got all the main players here. 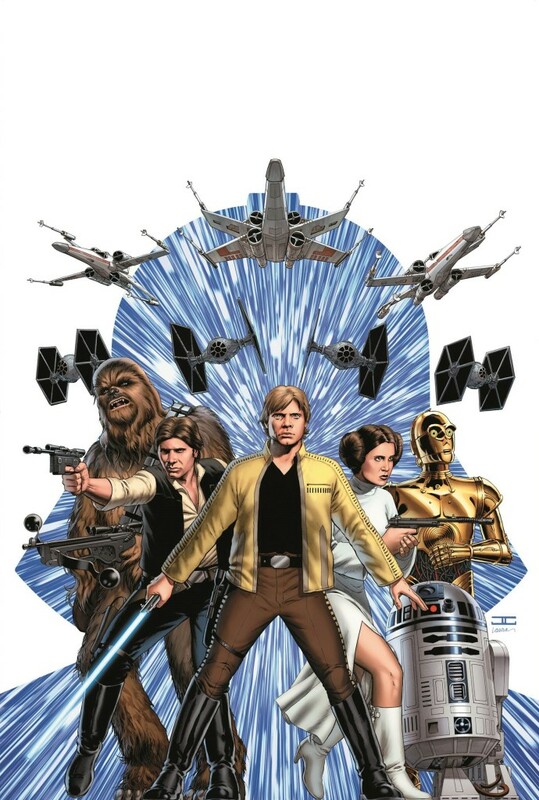 Luke, Han, Leia, Chewie, the droids, and Darth Vader all get big moments in this first arc, and that’s our core cast going forward. I do want to be able to use Obi-Wan Kenobi. I’ve always liked the old Ben Kenobi version of Obi-Wan, so we will see him in some capacity. Just, please, give us Mara Jade back! If you’re looking for another good Leia story, check out Empire & Rebellion: Razor’s Edge. It’s not canon anymore, or at least has yet to be acknowledged, but was still pretty good. I reviewed it a few months ago here…..Just in case you’re interested. You’re right though, most of the other now-Legends stuff is sorely lacking in Leia. Or at least, Leia-centrism. There are quite a few where she plays a fairly significant role, but only a couple where she’s the star. Only Tatooine Ghost and Splinter Of The Mind’s Eye come immediately to mind, and the latter contains….issues….of it’s own. She wasn’t even really the star of The Courtship Of Princess Leia, that was mostly Han, if I recall…..
Ostrander & Duursema would be incredible, yeah! I guess they feel they have enough talent in their own stable, sadly. We’ll see, though – cautious optimism is probably an accurate description of my own feelings at this time, too! Thinking about other Leia stories, I usually go for the Black Fleet Crisis, where the Leia thread is, for me, the strongest of the three plot strands there. Some have criticised her for being too harsh or whatever, but I feel it’s a pretty natural progression from the character we see in the movies. Otherwise, though, she is pretty lacking in any substance, sadly. I’m looking forward to getting Razor’s Edge though, seems like it should be a good one after reading your review! Thanks for that!